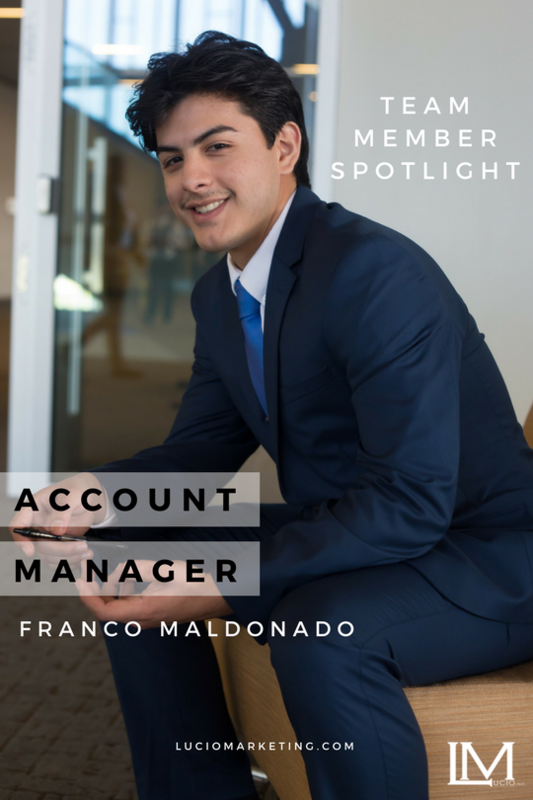 TEAM MEMBER SPOTLIGHT SERIES: Franco Maldonado | Lucio Marketing, Inc. Welcome to our Team Member Spotlight Series, in which we sit down with one team member a week in a rapid fire Q&A to find out a little bit about the people who make up Lucio Marketing Inc.
Meet Franco Maldonado, an essential team member here at Lucio Marketing Inc. We are very excited to have Franco on board our ever-growing team. Franco is originally from Mission Texas and started off working at our McAllen office. When Franco became one of our top Account Managers we knew he would be a great fit to be part of the team who would expand to Laredo Texas. Franco has been at our Laredo office since day one of our expansion there, back in July 2017. He is helping lead our team to success in Laredo Texas and has taken on many important rolls since moving to Laredo. 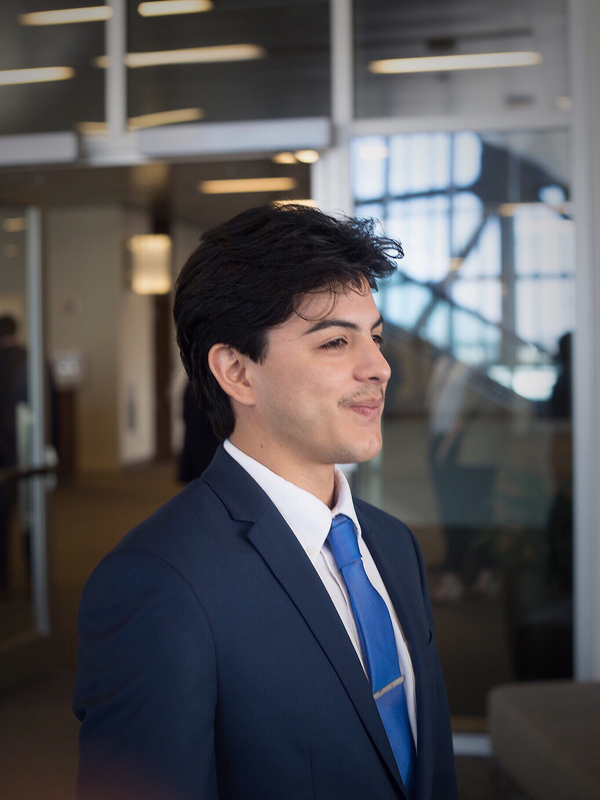 Franco is developing into a great leader, an outstanding Account Manager who is helping shape our business, and our featured Lucio Marketing Team Member this week in our Team Member Spotlight Series. Like all our Account Managers, the skill Franco brings to the team is greatly appreciated. Each segment we will feature one of our team members, find out what he/she does in Lucio Marketing , and how he/she works in Lucio Marketing while being part of our expanding team. As well as some fun facts! A: I've been with the company since February 2017. A: My favorite part about Lucio Marketing is that everyone is striving for personal development and growing everyday. I like that we motivate each other to be stronger in the business. A: That the opportunity to create and run your own office is amazing but also being able to become financially free. A: I like to write music lyrics and read. A: Don't have a preference, but if I had to pick it would be Facebook. A: I feel most creative when I communicate with people and network with people. A: It's typically my bed. I also really like the outdoors, its peaceful. A: I love to travel. Anything that involves traveling is fun for me. A: Lucio Marketing has helped me with an opportunity to become more financially independent, and also helped me maintain a positive attitude. A: Really great, everything is explained to you so you won't feel left out. A: Lucio Marketing treating all of us to dinners, game nights, and just hanging out at the office. Everyone has a good time. A: When I got mentioned as one of the top reps in the nation on our national conference call. A: Hip-hop is my favorite genre. Andy mineo, derick minor, NF, the black keys, and Eminem. A: If you can take the punches in life, you've already won part of the battle. The other part is not giving up and accomplishing your goals. A: Growing in personal development. A: Just to have fun, remembering why you want to grow and become successful, and always be accountable. If you want to find out more about Franco Maldonado’s work or about Lucio Marketing and what we do, follow us on our social media channels.